We asked our readers to name the best subscription boxes of 2019, and these are the results! Check out all of the awesome results here, or read on to see which wine subscriptions our community recommends! Cheers to these delicious, convenient wine subscription boxes, which deliver amazing wines to your doorstep on a recurring basis. No more feeling overwhelmed in the wine aisle, wondering which bottle to buy. No more running to the wine store to grab a great bottle before a party or special occasion. These wine-of-the-month clubs make it simple and affordable to stock up on wines that impress. Read on to see which subscriptions our readers are loving, or check out our full list of wine subscription boxes here! The Cost: Prices start at $13/bottle with free shipping for orders with 4+ bottles. Subscribe here! COUPON: Get $25 off your first order when you use this link! About the Box: When you sign up for Winc (formerly known as Club W), they walk you through a fun and easy survey that collects your preferences. No worries if you’re not super knowledgeable about wine—the questions are designed to be easy for newbies and aficionados alike to answer. (Think friendly queries like “How do you like your coffee?” and “Do you like citrus?”). Winc uses your results to match you with unique, affordable wines you’ll love. Go with Winc’s recommendations, customize your box to your liking, or skip the month if your wine rack is already full! Read our Winc reviews or check out our Winc info to learn more. Ships to most of the US. The Cost: $59.99 per quarter. Subscribe here! COUPON: Use code MSAWineForMe to get $10 off. Sign up here! About the Box: VineOh! is the perfect treat yourself pick! 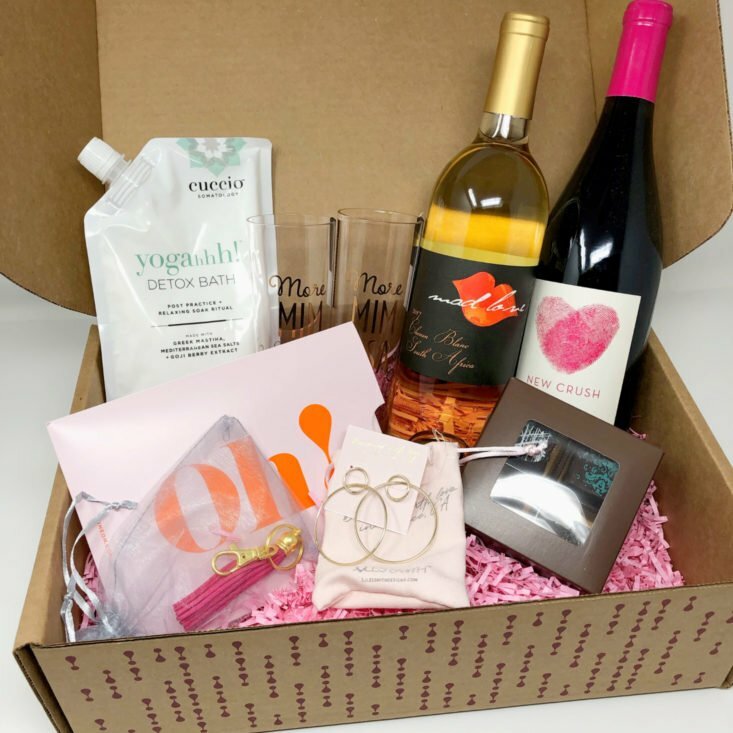 In addition to two unique wines, each quarterly box includes a slew of lifestyle items, such as sweets, cute accessories, jewelry, and self-care surprises. Check out our VineOh! reviews or our VineOh! info learn more. Ships to most of the US. The Cost: Plans start at $29.00 per month. Subscribe here! About the Box: Cellars offers a ton of different wine subscriptions—get single bottles, bottles that represent specific regions or flavor profiles, and even bottles that score high on trusted wine scales. This family-owned and -operated subscription is perfect for wine drinkers looking to explore! Check out our Cellars Wine Club info to learn more. Ships to most of the US. About the Box: Did you know that this super popular meal kit service offers wine plans, too? How cool! Choose to receive all reds, all whites, or a mix of both. The sommeliers at Hello Fresh even recommend which wines will go best with the current dishes in their meal kit, so you can start pairing like a pro! Check out our Hello Fresh reviews or Hello Fresh info to learn more. Ships to most of the US. The Cost: $65.99 per box (plus applicable taxes). Subscribe here! About the Box: Since Blue Apron was voted the most popular Meal Kit Box this year, it’s not too surprising that their wines would show up here, too. Blue Apron Wine sends six bottles that have been selected to complement upcoming Blue Apron meals. Their 500ml bottles are about 2/3 the size of a regular bottle, which is a great size for two to share over dinner. Read our Blue Apron Wine Reviews to learn more. Ships to most of the US. The Cost: $60.00 per month. Subscribe here! About the Box: Bright Cellars starts with an easy flavor profile survey then delivers personalized wine recommendations, and lets you weigh in on what you got (so you can get even better selections next time). Buy more bottles of your favorites, plus wine accessories on their online shop! Read our Bright Cellars reviews to learn more! Ships to most of the US. The Cost: $44.95 per month with free shipping. Subscribe here! About the Box: Founded in 1994, the Great Clubs’ Wine of the Month Club is a long-standing club that offers premium wines, including varieties of red and white wines from Australia, South Africa, Italy, France, Chile, the United States and beyond. Read our Wine of the Month Club info to learn more. Ships to most of the US. The Cost: Options starting at about $37/shipment ($24.96 + shipping). Sign up here! About the Box: The Original Wine of the Month Club has been curating wines for its members since 1972. The company is now run by second generation owner Paul Kalemkiarian Jr. and touts clubs for all budgets and palates. Read our The Original Wine of the Month Club info to learn more. Ships to most of the US. The Cost: $72 per quarter. Subscribe here! COUPON: Use code MSA5 to save 5% off any subscription or limited edition box– sign up here! About the Box: Every month, VINEBOX sends you three varieties of red or white wines in signature vials that hold a glass of European wine each. It’s a great way to try before you buy, or to simply sample a number of wines without letting anything go to waste! Read our Vinebox Reviews to learn more. Ships to most of the US. The Cost: $45 a month for 3 bottles and $75.00 per month for 6 bottles. Subscribe here! COUPON: Get your first box for $39 when you use this link! About the Box: Wine Awesomeness is a monthly wine subscription that specializes in rare and unusual wines with plenty of crowdpleasing appeal. Their wines are selected each month by a curatorial team that includes a Food & Wine Sommelier of the Year, and the packages come with a cool magazine with pairing ideas and more. Check out all of our Wine Awesomeness Reviews to learn more. Ships to most of US. The Cost: Starting at $40.45. Subscribe here! What you’ll get: The California Wine Club features a different, small family winery each month. Members receive two of the hand-selected wines and Uncorked®, their guide to the wines. Subscribers choose from the Premier Series, Signature Series, International Series, Aged Cabernet Series, or Pacific Northwest Series. Check out our California Wine Club info to learn more. Ships to most of the US. The Cost: Plans are $87.99 for 6 bottles or $159.98 for 12 bottles, plus tax. Subscribe here! COUPON: Get your first box for 50% off, no coupon needed– sign up here! About the Box: Martha Stewart Wine Co features wines chosen by Martha Stewart herself! You can choose to receive a half-case of 6 bottles every 6 weeks, or a full case of 12 bottles every 8. And like many subscriptions, can pick red, white, or both. Check out our Martha Stewart Wine Co info to learn more. Ships to most of the US. The Cost: $79.98 per monthly box. Subscribe here! About the Box: Firstleaf is a monthly wine subscription that believes that buying great wine should be easier. Choose red, white, sparkling, and rosè (or combinations). Subscribers can also choose to receive domestic wines only, international only, or a mix on a schedule of their choice. Check out all of our Firstleaf reviews to learn more. Ships to most of the US. The Cost: Plans start at $39.00. Subscribe here! About the Box: Gold Medal Wine Club seeks out wine from California’s “best boutique wineries” and sends it directly to your door every month. Choose a theme that fits your interest and budget, and start receiving some awesome wines. Read our Gold Medal Wine Club Reviews to learn more. Ships to most of US. The Cost: $50.00 every 3 months. Subscribe here! COUPON: Use code FREEADDICTION to receive a free gift with your first box! About the Box: Uncorked Box is the perfect gift for the wine lover in your life! While the box doesn’t actually include any wine, subscribers get tons of quirky, high-quality wine accessories and gifts. Read our Uncorked Box reviews to learn more. Ships to US. That wraps up our list of the best wine club subscription boxes! Did your favorites make the list?